From its terrifying start in the night skies of Afghanistan to its stunning end in the Paris terrorist attacks, Assassins is, in novelized form, the story of the last thirty years of war between Islam and the West. Based on the author’s experiences in the Middle East, Assassins lives this unending conflict from the viewpoints of an American commando, a French woman doctor, an Afghani warlord, a Russian major, and a British woman journalist. Drop by parachute into the deadly mountains of Afghanistan, fight door to door in the bloody cities of Iraq and the lethal deserts of Syria, Sinai and Africa, know the terror of battle inside a Russian tank, feel the power of passion and love when at any moment you both can die – it’s all there, all real, in Assassins. Did the Saudi government finance 9/11? Did the Bush administration let Osama bin Laden escape Afghanistan and then lie about Weapons of Mass Destruction in Iraq? Did President Obama’s decision to leave Iraq in 2011 lead to the rise of ISIS and its worldwide fanaticism? 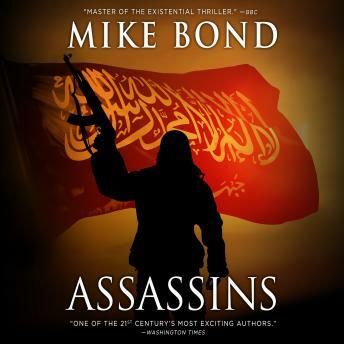 First, i do not write reviews, but I felt compelled to do so with this book and author, secondly I will not read or listen to another of Mike Bond's books. His political views are very liberal and I believe misguided, he has demonstrated in his writing that hie believes in his anti establishment rants against big oil and the two Bush presidencies, certainly there is a small bit of truth but he is extreme. He has no issue capitalizing on the popularity of political thrillers, I suppose thinking he will turn his readers/listeners into believing his diatribe. No, I will not subject myself to any more of my books and encourages you to listen only for entertainments sake,.